Plug in the AC adapter and power the Nintendo DS Lite handheld video games systems off of any 120-volt outlet. 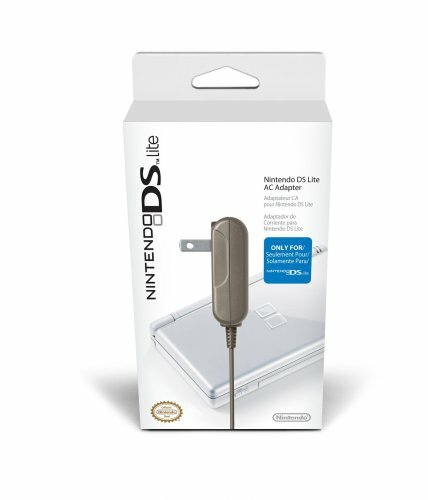 The AC adapter allows you to recharge the battery packs for the Nintendo DS Lite system, even while you play. The small, lightweight design allows you to easily pack the AC adapter along with your handheld system for a convenient back-up power source. This adapter will not work with the original Game Boy, Game Boy Color, Game Boy Pocket, original Game Boy Advance, Game Boy Advance SP, Game Boy micro or Nintendo DS systems. This adapter will only work with Nintendo DS Lite Hardware. Conveniently gives your DS Lite battery a boost whether you are on a business trip, in a hotel, or at home.